The Tickets screen is where you view and manage all your orders for the day. Common tasks performed from the Tickets screen are resuming held orders, providing refunds and reprinting receipts. To access tickets, tap the small icon in the top right corner that looks like a ticket. The default view in Tickets is List View. Here you can see all of the day’s cheques in order. The most recent at the top. 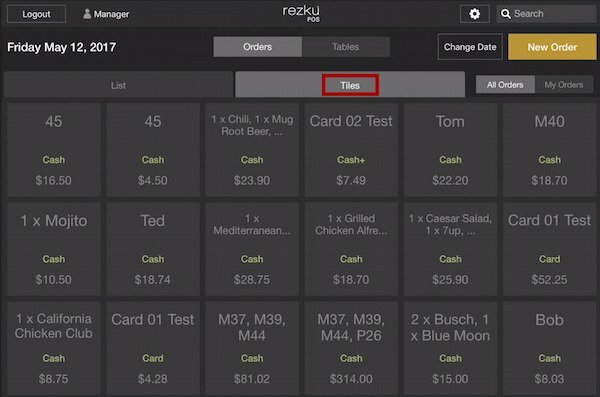 ID - Each transaction in Rezku POS is given a unique transaction ID. 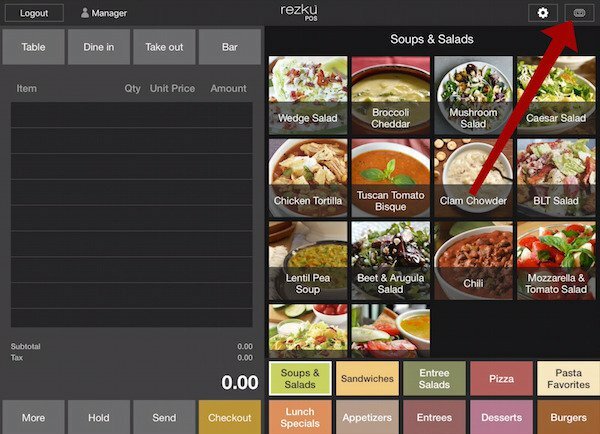 Names - Depending on your Restaurant Settings, a numerical or text name may be required for orders. If none is provided, Names will show the items the guest ordered. Type/Status - Shows order status. (See Below for a description of each status). Total - Total for the order, in dollars. Date and Time - When and order took place. In Tile View tickets are displayed as large boxes that are easy to tap. The most important information is displayed prominently. Name, Number, Tables, or Items - Whichever is provided. 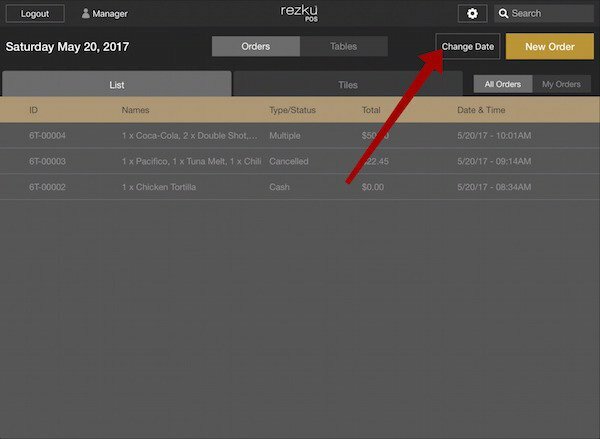 Order Status - Shows payment method or Open. Total - Total of check in dollars. Open - Payment has not been completed. These are orders pending Checkout, such as tickets on Hold. To resume an open order, just tap on it. You can add more to the order or tap Checkout to take payment. Canceled - Order was canceled. Cancel is under the More button, near the bottom of the order screen. Canceling an order requires manager authorization by default. Awaiting Signature - When providing full service, this status indicates the guest’s signed receipt must be accounted for. When completing these transactions, the credit tip amount needs to be entered. When completed the status changes to Card. Depending on the ticket status you have different options. Tapping a ticket with an Open status reopens and takes you back to the New Order screen. From here, continue taking the order or tap Checkout. Tickets with an Awaiting status need confirmation that the guest signed the receipt. Tap the ticket and enter the credit tip amount to complete the transaction. Canceled transactions can be reopened. Just tap on the ticket, then the gold Reopen button. Continue the order just like any other. Add items or go to Checkout, it’s not canceled anymore. 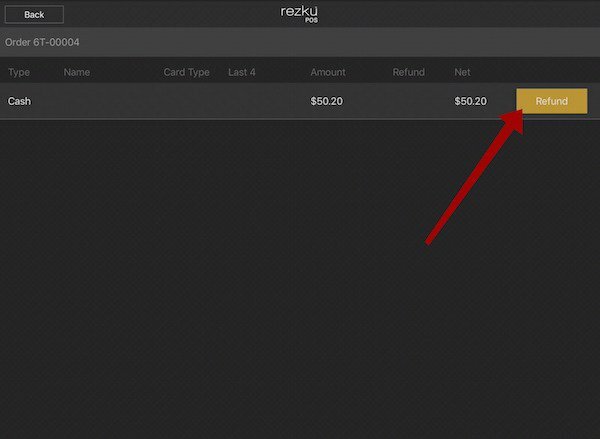 To refund an order, tap the ticket and then tap the Transactions button. 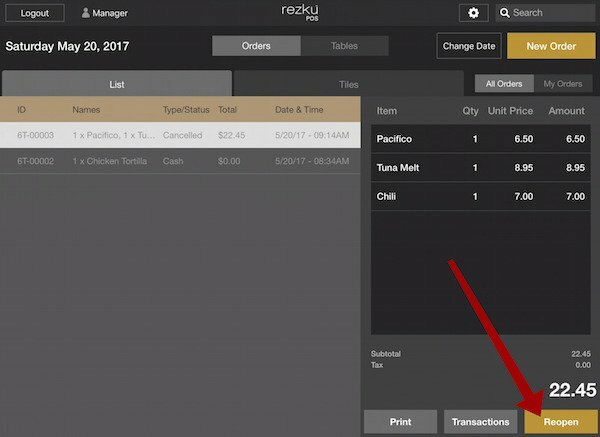 The transaction view shows the unique order ID, payment method, and amount. 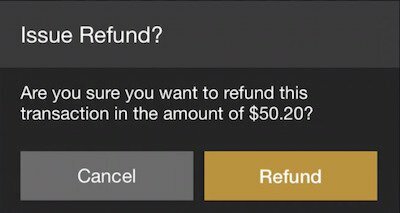 ● To refund an order, tap the gold Refund button on the right. After tapping the Refund button, a confirmation window appears. 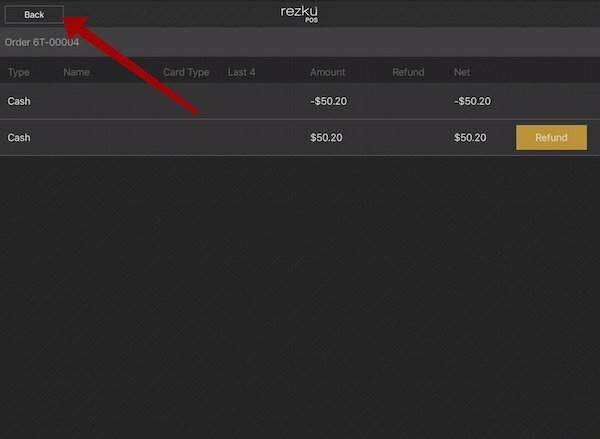 The transaction screen will record the negative amount, indicating a refund. Tap the back button to return to Tickets. Tickets view will show you today’s orders. To view the tickets from a different day, tap the Change Date button. 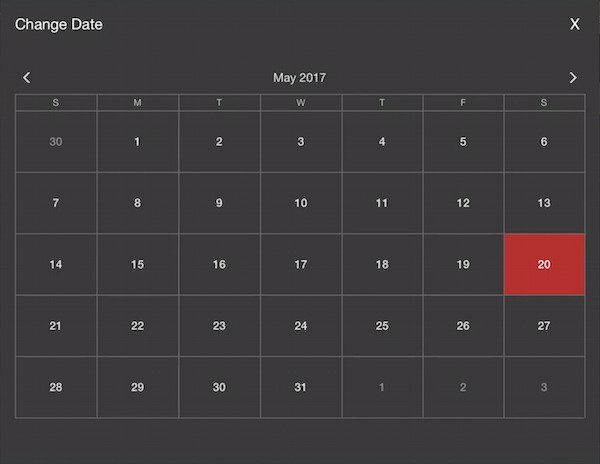 When the calendar opens, tap the day you’d like to view orders for. ● Tap the New Order button to exit Tickets and take your next order!